I love listening to the cricket on the radio and I have lost count of the number of times the commentators put “the curse” on a batsman, saying how they are about to make a century and they get out next ball! I can’t help wondering if I didn’t do the same to Simon who I was convinced was going to win “The Crackington” and practically had you opening the champagne last month. It wasn’t to be which is a real shame as there wouldn’t be a more deserving winner. Here at Chaos Manor I am not getting sorted very quickly. 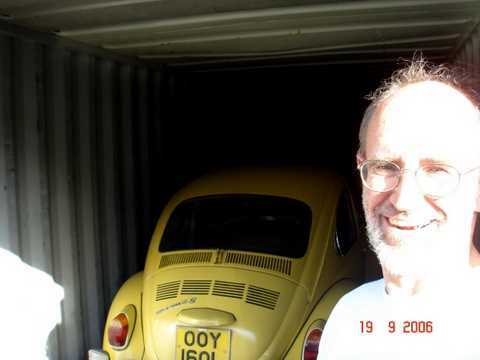 However, I have got the Beetle back (thanks Neil) and I hope to drive that on The March Hare and The Lands End. I think the Dellow may take a bit more time but it would be nice to get that going for Classics on the Common. Well done JP and Neil on their recent achievements. 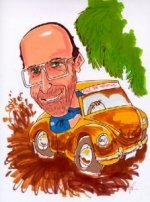 After many years devoted to V8’s, where it was very difficult to get the power down, John has developed the ex-Graham Marshall, ex-David Thompson buggy into a super-competitive and reliable machine. Mind you I don’t know how much of the car is left after his rebuilding! Neil kept us in suspense right up to the wire, and we didn’t know he had won the championship until some twenty minutes after the race ended as we had to wait for the official results to see who got fastest lap. Finally lets keep our fingers crossed for Simon Groves who gas every chance of winning the ACTC Crackington Trophy. On a personal note I am slowly getting sorted out here at Bromham. There have been mega problems with the broadband but they seem to be resolved now the nice man from BT has visited and sorted the wiring. First things first. You will see I am using a different email address. I am now a real convert to the way Google do things. Email, Calendar, Word Processing, Spreadsheets, Photo Albums and some other stuff I have yet to master. The old email address still functions but for me Google is the way to go along with Skype for phone calls. Don’t tell me you don’t have Skype yet! By the time you read this I will have moved, yes again, but this time its to what I hope will be a permanent place. It’s at Bromham on the outskirts of Bedford and I should be re-united with my cars and stuff around Christmas time. The goal is be driving by The March Hare. Before that comes the final race of Neil’s racing season with the prospect of winning the championship. No pressure then! After a few months of rest, well decorating a house from top to bottom!, its back to some Motorsport. The trials season has started again and they will come thick and fast now. However, Neil’s racing season hasn’t finished yet and with one race to go he is joint second in the championship with a chance of winning provided the leader doesn’t win his class! On a personal front things are slowly moving forward and I have my cars back, although without a proper place to put them they are in a container in Hitchin at the moment. The goal is to be out trialling again by The March Hare. The trip to Holland has made me very interested in old cars. 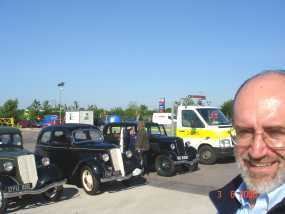 With its more modern engine the Dellow doesn’t quite come into that category so I may soon be shopping for a new toy! Well after producing 136 editions of Classical Gas I finally missed one last month. It was all down to personal issues. I have been living in a rented house on my own for nearly two years. Then last month everything happened at once. I had to move, I became formally single again and a lot of other things as well. So no printed edition. I kept up with the Internet site so many of you will not have missed anything. I think it will only be a matter of time before that becomes the primary media. As you can read here I have been supporting Neil during his racing season and we have the possibility to win the championship. The evenings are drawing in now and the trials season approaches. I am really looking forward to trialling again. Hopefully behind the wheel of a car again sometime in the new year. Lots of things going on in the last month. Trials, races, shows, some off-roading and a trip to Holland for a week with Neil in his Y and C.
The Enfield Pageant was affected by the rain. We went on the Saturday to give me practice driving the C. The ground was very soft then and by the next day they couldn’t let any more vehicles onto the site. Shame as this is a great day out and you can often find a bargain. Neil picked up a Stenner bead breaker for £10. Neil’s racing is still going well and he leads the championship by 9 points. By the time you read this we will have been to Croix in France for a Double-Header which will be exciting. More about Neil’s racing exploits next month. I hope you have enjoyed Claire’s reports as much as I have. I am quite jealous of their adventures and hope to be back following in their footsteps soon. It was another cheap Lands End for the MCC, with very few Gold Medals because of a genuinely difficult challenge on Hoskin and the rather artificial obstacles at Bishops Wood and Blue Hills 1 taking their toll. It was a challenging event for the organisers as well, with big delays at Riverton and lots of problems at Blue Hills 2 with at least three competitors overturning and so many queries with the scores they had to be taken out of the results. It was a good Lands End though, so lets hope the organisers have can solve the problems without to many changes. I have been supporting Neil with his Motor Racing again this season and it has started very well with four straight class wins, putting him well ahead in the championship. A few weeks ago I had a great couple of hours with Murray MacDonald in his newly acquired Suzuki. Hopefully it won’t be to long before I can acquire one of these fantastic little machines. The March Hare was a closely fought event, deservedly won by Duncan Welch when he got away from the “impossible” re-start on the last hill. I was marshalling in Binghams Wood which is turning into a fantastic venue. It was such a shame that Mike Pearson wasn’t well enough to be out and about on the day as the new sections were mostly down to a lot of hard work with his chain saw earlier in the year. Not forgetting that we were only there at all because of his relationship with the land owner. A few weeks later we had another successful trial at Edlesborough when Clerk of the Course Ed Nikel was rewarded by a great entry and good trialling weather. I missed Edlesborough as I was at Snetterton with Neil in his Capri. It was a great event, results wise, with a class win putting him ahead in the championship. Not the greatest organisation though with scruitineering and qualifying on Saturday and the race on Sunday. This either meant a lot of hanging around or two trips which is what we did in the end. Its been a very busy start to my Motorsporting year with only one week-end “off” so far. It’s been mostly trials with the exception of a trip to the Historic Motor Sport Show. This month will see the start of Neil’s racing season in the Capri. There was a test session at Silverstone planned but thats been called off as Neil has broken his collar bone! In the Classic Trials World Simon Groves is a leading contender in the ACTC Crackington championship with maximums on the first three one day trials. What with that and being a triple contender there’s no pressure on Simon! Falcons season opener at Brickhill looked as if it was going to be disaster when we turned up, the place was such a mess. I have never seen it so bad in the 35 years I have been going there. However, JP sorted it all out and by the end of the day even the moaners were enjoying themselves. I had a great Exeter passengering Simon Groves. Unlike classes seven and eight we only had one re-start and that was a very easy one. Simms was quite dry. Simon got it just right and we flew up. The only thing is it all happened so quickly that I don’t remember it! It was a much tougher event for the sevens and eights with the Tipley restart being a real thorn in the side, costing golds and triples to many. As ever the convivial atmosphere at the finish hotel made a very nice end to the trial and JP secured us the usual Falcon table and regular waitress despite the place having a new owner. MCC President Ron Butcher made a valiant attempt at a prize giving but as usual few could hear him which is a real shame as this could be a nice occasion. Shame the MCC can’t organise a proper PA. The trialling year has started with an enjoyable Exeter Trial although it was certainly a tough one for classes seven and eight who had a lot of restarts. Interesting to see it didn’t have a full entry and the debate continues in the MCC if Class 0 is the way to go, despite last summers survey saying “it ain’t broke so don’t fix it”. Neil has got his Capri back together and it looks even better than before its inversion. All we want now is the 2006 calendar which is still not available. I am still separated from my cars so have been spending a lot of time experimenting with different things on the Internet, including live reports from the passenger seat of Simon’s car when I have passengered him. Only problem is that with my head stuck in a Blackberry I don’t get to help pump the tyres up!